It’s Just a Baby Tooth! Baby teeth get cavities. Let’s face it: it can be a real challenge to brush a young child’s teeth, much less floss. To make matters worse, young kids typically prefer a high starch diet and tend to steer clear of those super fibrous veggies that are so good for your teeth (link). Add it all together, and cavities are fairly likely for those precious little baby teeth. But after all, it’s not a big deal, is it? It’s just a baby tooth. I hear this all the time when we recommend fillings on baby teeth. And to some extent, it’s true. Sometimes it is not worth filling a baby tooth. Permanent teeth come in on a pretty predictable time line, even if there is a little variation person to person (link). If we know that baby molar is probably going to come out in the next year or so, and the cavity seems small, we will likely recommend just keeping an eye on it and pulling it out if it becomes painful. However, there are many cases where this is not the best course of action. 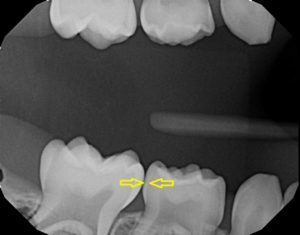 Why bother to fill a cavity on a baby tooth at all? Well, first and foremost to prevent pain. No one wants to see their kid suffer with a tooth ache. Baby teeth have incredibly thin shells of enamel compared to permanent teeth. That means that when a cavity starts, it only needs to burrow through about a millimeter of enamel before it hits the dentin layer, where it can take off like lightning. Once it gets near the nerve, watch out. The pain of a toothache is hardly tolerable for an adult, much less a child. Sometimes, the nerve of a baby tooth will become surrounded by skin to protect itself, and the tooth will cave in completely before the child feels pain. So why not just pull it out early to prevent pain? While this is sometimes (not always) a less expensive option, it is only recommended if the baby tooth is very close to the point where it would fall out on its own. When a baby tooth gets ready to shed on its own, the roots shrink. This means that an extraction is pretty easy and the recovery is very fast. A baby tooth that is pulled far before its time has full roots, making the procedure more invasive and far more uncomfortable. Each baby tooth has an important role in setting up the space its permanent tooth will need. If you pull a baby tooth too early, it can affect the way the permanent teeth come in, and even potentially damage them. We need to hang onto our baby molars until about age twelve or thirteen. Pulling them out just because they have a cavity around age six or seven means several years of potential shifting and misalignment. 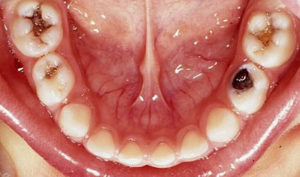 However, it does sometimes happen that a baby tooth is beyond saving and must come out before we would prefer. In this situation, your child’s dentition will be best served by a space maintainer placed by an orthodontist to prevent shifting and alignment problems. While they are temporary, baby teeth are still very important and very much worth caring for. Obviously, a good defense is the best offense in this situation, and great home care including flossing, brushing twice per day (with help! ), and using a Fluoride tooth paste will go miles in preventing cavities from starting. But if they do happen, don’t fret. We will get it taken care of. The right way. Keep smiling, Orlando! Especially if it’s with baby teeth! Look at those adorable baby teeth! They deserve the best. 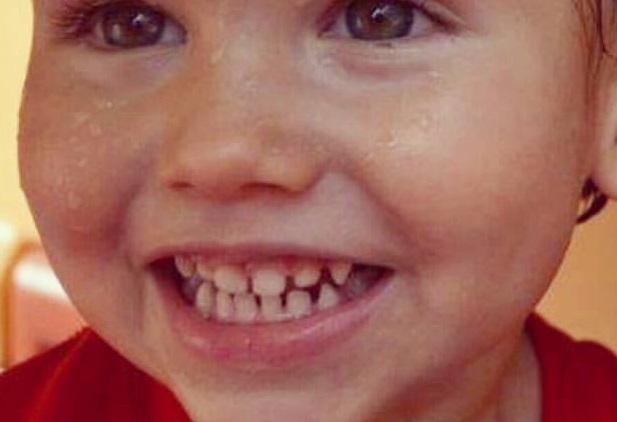 Cavities happen on front baby teeth very easily. Those baby molars need another six or seven years before they come out! The enamel of a baby tooth is super thin. Sometimes less than one millimeter!